Edit (1/22/10): Eater LA reports that due to the rain, the opening has been postponed to January 30 (or even later)!! Set to officially open on January 23, 2010 is the 4th installment of Pitfire Pizza, featuring artisan pizzas hand-crafted with the freshest, finest ingredients – some of which are grown in their very own garden out front. I arrive at the soft opening unsure if I’m in the right place at all (part of it is still under construction) but still felt drawn to the warm glow of the space. First of all, the address says Culver City, but I Google map the address to find it’s south of Santa Monica Airport. Er? Good thing I spot Diana Takes a Bite. And then as I enter, I eye lucious vegetable and salad plates on the table, ready for absorption. Zing. The chicken salad ($10.95) was delicious as was the Farmers Market Roasted Vegetables ($9.95)Â – which were done to a perfect tenderness. 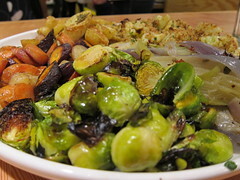 The brussels sprouts were still firm and the seasoning was subtle and complimentary. Another favorite was the cauliflower, which came with mild redÂ pepper and a light dusting of crumb. Get these vegetables. Truth be told, I’m a novice in the Pitfire Pizza experience – with only one dinner under my belt at the downtown location, close to The Edison, way back when. 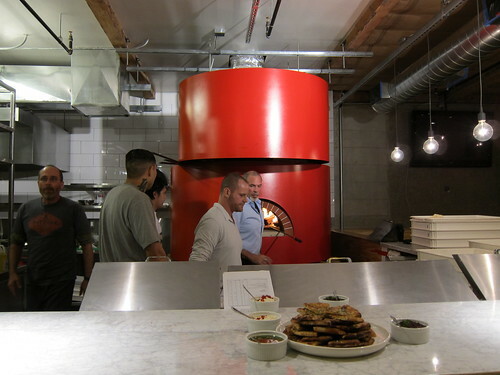 Even that flirtation was disqualified as I was informed that David Sanfield and Paul Hibler are trying to replace that oven with the ones at the other three locations – including the wood fired one at the new Culver City location. Sometimes you just know what ovenÂ makes your pizza taste better. They are also moving towards a more casual yet warm feel as indicated by this new location; the efforts proved successful as fellow bloggers and I had quite the time ooh-ing and ahh-ing about the food while enjoying each other’s company. To top it off,Â Diana and Sook shared a Lady & The Tramp-bonding kind of moment (see end of post). Veteran of Pitfire or not, I was certainly happy with the results this particular night. The pizza crusts were thin, perfectly crisp with just the right touch of butter permeating each crunch. 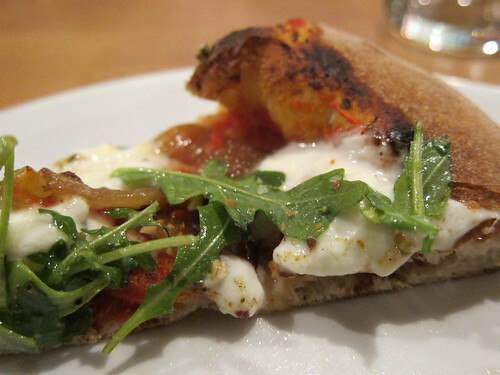 The tomato sauce, as were all the ingredients, were spry – especially the pile of arugula atop the Burrata Pizza ($9.95). The pepperoni was so thin and crispy, it was the delicate antithesis of the “Meat Lover’s” pizza. One meat – done well. The Field Mushrooms pie ($9.95) is perfect if you’re feeling particularly indulgent – what with fontina cheese, creme friache, mushroom jus, and flat leaf parsley. It’s not a rich pie, per se, but the right balance of the ingredients madeÂ it ratherÂ comforting. 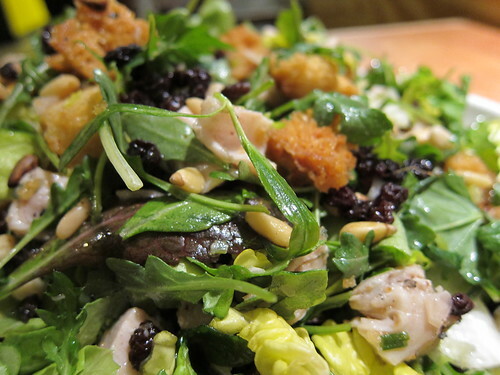 This entry was posted in Culver City, Food, West L.A. and tagged artisan pizza, Culver City, los angeles, Pitfire Pizza, pizza, preview, salads, soft opening, vegetables, Westside. Bookmark the permalink.